Forbes may have declared Kylie Jenner the youngest-ever self-made billionaire thanks to her Kylie Cosmetics empire, but there’s just one problem – she’s $100,000 shy of a billion. At just 20-years-old, Kylie has earned a massive $900,000,000 fortune, raking in big bucks from her cosmetics line, app, clothing line, TV programs and endorsements. This huge feat propelled her to the top of Forbes’ annual list of America’s Richest Self-Made Women – coming in at No. 27 – and landed her the cover of the esteemed mag. 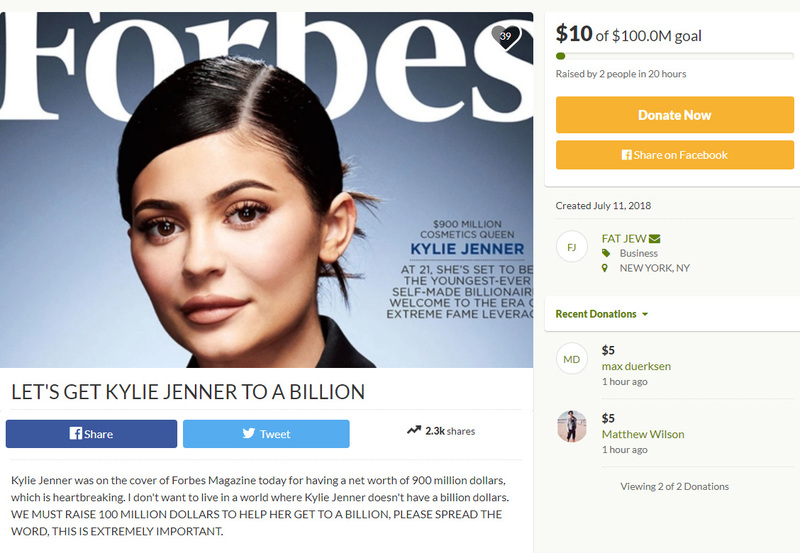 On Wednesday, comedian and Instagram meme king The Fat Jew created a GoFundMe page to help the youngest Kar-Jenner earn the title of billionaire faster with the “LET’S GET KYLIE JENNER TO A BILLION” campaign. “Kylie Jenner was on the cover of Forbes Magazine today for having a net worth of 900 million dollars, which is heartbreaking,” the description reads. As of Thursday, the campaign has only raised $10 out of the $100,000,000 goal with two generous donators pledging to support the cosmetics mogul. With Kylie Cosmetics’ summer collection and an ever-growing list of products, however, Kylie will likely make it to billionaire status without The Fat Jew’s help!